1Department of Molecular Microbiology and Immunology, Johns Hopkins Bloomberg School of Public Health, Johns Hopkins University, Baltimore, Maryland, USA. 2Department of Chemistry, Stanford University, Stanford, California, USA. 3Lawrence Berkeley National Laboratory, Division of Biological Systems and Engineering, Berkeley, California, USA. 4Howard Hughes Medical Institute, Departments of Molecular Physiology and Biophysics, Neurology, and Internal Medicine, Carver College of Medicine, University of Iowa, Iowa City, Iowa, USA. 5Department of Surgery, Harvard Medical School, Beth Israel Deaconess Medical Center, Boston, Massachusetts, USA. 6Department of Medicinal Chemistry and Institute for Structural Biology, Drug Discovery and Development, Virginia Commonwealth University, Richmond, Virginia, USA. 8Department of Pediatrics, University of Massachusetts Medical School, Worcester, Massachusetts, USA. 9Federation of American Societies for Experimental Biology (FASEB), Bethesda, Maryland, USA. 10Laboratory of Genetics LOG-G, The Salk Institute for Biological Studies, La Jolla, California, USA. 11Department of Internal Medicine, Department of Human Genetics, and Department of Pediatrics, University of Michigan, Ann Arbor, Michigan, USA. 12Center for Genome Sciences and Systems Biology, Washington University, St. Louis, Missouri, USA. 13Department of Biological Chemistry, Johns Hopkins University, Baltimore, Maryland, USA. 14Department of Bioengineering, Cleveland Clinic Foundation, Cleveland, Ohio, USA. 15Department of Chemistry, University of Wisconsin-Madison, Madison, Wisconsin, USA. 16Department of Medicine, Washington University, St. Louis, Missouri, USA. 17Department of Research Pathology, Genentech, South San Francisco, California, USA. 19Biomedical Chemistry Institute, Department of Chemistry, New York University, New York, New York, USA. 20Department of Immunobiology, Yale University, New Haven, Connecticut, USA. 21New England BioLabs Inc., Ipswich, Massachusetts, USA. 22Departments of Dermatology and Medicine, Brigham and Women’s Hospital, Harvard Medical School, Boston, Massachusetts, USA. 23Division of Blood Diseases and Resources, National Heart, Lung, and Blood Institute (NHLBI), Bethesda, Maryland, USA. 24Departments of Pharmacology and Neuroscience, Johns Hopkins University, Baltimore, Maryland, USA. 25Departments of Pediatrics and Biochemistry and Molecular Biology, University of Chicago, Chicago, Illinois, USA. 26Departments of Medicine and Cellular and Molecular Medicine, UCSD, San Diego, California, USA. 27Department of Chemistry, Tufts Institute for Innovation, Tufts University, Medford, Massachusetts, USA. 28Institute for Stem Cell Biology and Regenerative Medicine, Ludwig Center for Cancer Stem Cell Research, Stanford University, Stanford, California, USA. Address correspondence to: Ajit Varki, Departments of Medicine and of Cellular and Molecular Medicine, BRF2, Room 4126, 9500 Gilman Drive, MC 0687, La Jolla, California 92093-0687, USA. Phone: 858.534.2214; E-mail: a1varki@ucsd.edu. Or to: Ronald L. Schnaar, Departments of Pharmacology and Neuroscience, Johns Hopkins University School of Medicine, 725 N. Wolfe St., 318 Wood Basic Science Bldg., Baltimore, Maryland 21205, USA. Phone: 410.955.8392; E-mail: schnaar@jhu.edu. Authorship note: R. Sarkar is the NHLBI program representative. A. Varki and R. Schnaar co-chaired the working group. J Clin Invest. 2016;126(2):405–408. https://doi.org/10.1172/JCI85905. Every living cell in nature that has emerged from more than 3 billion years of biological evolution is composed of nucleic acids, proteins, lipids, metabolites, and glycans, and each of these components remains essential to all life forms. Until the 1970s, the study of glycans was thus an integral part of the exploration of all biological systems, generating major advances in fields as diverse as hematology, microbiology, metabolism, and material sciences. With the rapid advent of powerful insights and tools, the study of nucleic acids and proteins came to dominate the molecular biology revolution of subsequent decades. While similar revolutions in the biological exploration of lipids and metabolites have now followed, the study of glycans has been left far behind. The reasons for this omission are many, but can be broadly ascribed to the far greater complexity and diversity of this class of molecules and the related lack of comparable tools for their exploration. In analogy to the situation in cosmology, the “standard model” for approaching biological systems now largely excludes glycans, which have effectively become the “dark matter” of the biological universe: critical for a full understanding of biology and yet routinely ignored. While a small number of scientists persisted in the in-depth study of glycans (resulting in a specialized field called glycobiology), an entire generation of mainstream biologists was trained with little knowledge of the structure, analysis, or functions of glycans or even of the terminology required for discussing them. This anomaly in the history of the biological sciences has since trickled down to all levels of education, resulting in lost opportunities for a more complete understanding of the biology and pathology of living systems, which would also greatly benefit therapeutic development and medical practice. Very few scientists are thus now trained in understanding glycosciences, and studies of glycans have also lost prominent attention from major journals and grant review groups or recognition by honors and awards. Glycoscience is a highly interdisciplinary field that aims to better understand the structures and functions of glycans and how they can be used. It is a global field with a dedicated community of researchers in the United States and abroad. Glycoscientists do not have a single training/education background. They come from various fields, including physiology and developmental biology, where glycans are involved in processes such as cell movement and tissue development. They are in medicine, where glycans are involved in the development and progression of chronic and infectious diseases. In microbiology, glycans are key players in interactions among and between microbes and host cells. Glycoscientists are chemists developing new synthetic and analytical methods for glycans, and biochemists working to understand glycan synthesis and metabolism. In materials science, glycans can be used as polymeric materials having a wide range of properties. In computational science and informatics, modeling studies and the effective analysis of large amounts of experimental data are also necessary to better understanding glycans. In the area of human health, the NRC report also noted that (a) glycans are directly involved in the pathophysiology of every major disease; (b) additional knowledge from glycosciences will be needed to realize the goals of personalized medicine and to take advantage of the substantial investments in human genome and proteome research; and (c) glycans are increasingly important in pharmaceutical development. Among the resulting roadmap goals in the NRC report were specific comments and recommendations regarding enhanced training in the glycosciences. 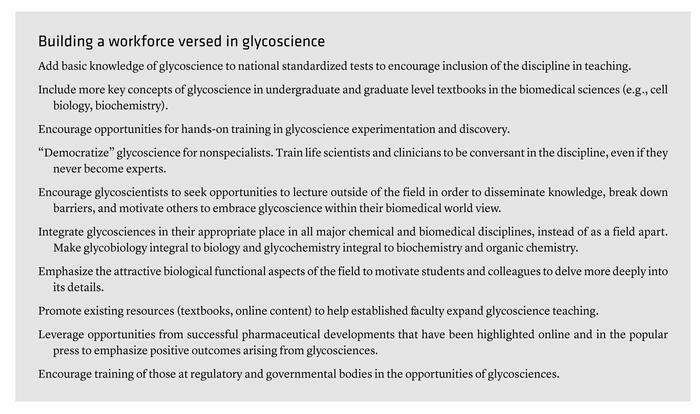 The committee notes that there is widespread lack of understanding and appreciation of glycoscience in the scientific and medical communities and among the general public. Glycans are integral components of living organisms, whether human, animal, plant, or microbe, and glycan products have applications in health, energy, and materials science. The committee concludes that integrating glycoscience into relevant disciplines in high school, undergraduate, and graduate education, and developing curricula and standardized testing for science competency would increase public as well as professional awareness. Within 10 years, glycoscience will be integrated and taught at every level wherever it is relevant to understand the scientific content. In response to the overall NRC report, the NIH Office of Strategic Coordination via the NIH Director’s Common Fund released a series of requests for applications with the following program initiatives: (a) developing methods and technologies for synthesis of biomedically relevant carbohydrates; (b) developing accessible tools for probing and analyzing carbohydrates and their interaction partners; (c) developing data integration and analysis tools. Notably lacking was any direct support for training in glycosciences. It was the charge of this working group to consider further the need for mechanisms to address this unmet need. The working group defined its objectives as follows: “Discuss the value and mechanisms of training the next generation of biomedical investigators in the glycosciences, with the goal of bringing glycoscience back into the mainstream of biology — by generating a critical sustainable workforce that will advance the translation of glycosciences in biology and medicine, and help integrate glycoscience education into the curricula of medical and graduate schools” (1). There is increasing recognition of the diverse roles and uses of glycans in biology and medicine. Yet glycoscience has not gained much attention in the mainstream of biology and is viewed as a niche research area with relatively few qualified researchers. While high school, undergraduate, and graduate students learn about nucleic acids, proteins, lipids, and metabolites, their competency in understanding the chemistry and biology of glycans is now conspicuously deficient. Also, compared with the NIH investments made in understanding other major components of life, glycans have received very little attention. This chasm needs to be addressed by training a new generation of biomedical researchers for whom glycans are an integral part of their mainstream thinking. The working group discussed the role of glycosciences in the discovery process. One theme that repeatedly arose was that the field is indeed poorly represented among researchers and lecturers at most biomedical research institutions. Despite this, some great advances in biomedical discovery in several areas, including hematology, immunology, infectious diseases, genetic diseases, cancer, and neuroscience, have been facilitated by the coincidental proximity of key investigators to colleagues who understood the glycoscience aspects of their research and also had the motivation and tools to apply this understanding to the biomedical challenges at hand. Without such serendipitous input, the discoveries would have been delayed or not been made at all. Furthermore, without knowledgeable faculty in many biomedical educational institutions, there is a striking absence of lectures and seminars in the area. This creates a feed-forward self-perpetuating deficit of knowledge in the field. Glycosciences are not taught (or are barely taught) at many institutions, leading to a generation of otherwise superbly trained physicians and biomedical scientists who are nonetheless unfamiliar with language and basic knowledge in this key aspect of all biological systems. When such individuals enter the biomedical workforce, whether in academia, science administration, or the drug discovery and diagnostics industries, they are unlikely to grasp the implications of glycosciences for their own work or that of others. They are also unlikely to sufficiently emphasize glycoscience training in the curricula they develop. Generation after generation, we are now losing ground with regard to the potential of this discipline. For those few who do make glycosciences their career, the rewards of discovery are hard fought, often against significant resistance from editorial boards, grant review committees, and biomedical investment groups who lack the basic knowledge of glycosciences necessary to understand the goals and opportunities at hand. Despite these challenges, significant advances have been translated from glycoscience discovery to the clinic. For example, many groundbreaking biologicals now in the clinic, including cytokines, such as erythropoietin and all monoclonal antibodies, are glycoproteins that are expressly dependent on their glycans for pharmacodynamic and pharmacokinetic properties, stability, and function. Important vaccines have been developed based on microbial glycans, such as pneumococcus and haemophilus polysaccharides. In addition, glycomimetic compounds developed to target glycan-binding sites on functional glycan-binding proteins are now showing promise for syndromes such as sickle cell crises, with more under development by the biotech and pharmaceutical industries. A consensus arose on the committee that the basic and therapeutic significance of glycosciences has already been well established, with more progress on the way. But maintaining and accelerating translation in glycosciences will require a reversal of the ongoing year-over-year deficit of knowledge in this area among most biomedical scientists. One solution will be to populate major academic research centers, research institutes, government laboratories, and drug development companies with colleagues who have experience and knowledge in the glycosciences. But the pool of such individuals is currently very small. Potential resources that will help correct this situation are discussed further below. In addition, we believe several key actions are required to bring more of our trainees and colleagues on board, as detailed in Building a workforce versed in glycoscience. It is the consensus of the working group that bottom-up rebuilding of the glycoscience enterprise with a long-range perspective will enhance all aspects of biology and medicine. In particular, investing resources in populating the biomedical research enterprise at all levels with individuals trained in the discipline will have outsized positive effects on discovery. The presence of trained glycoscientists as researchers, faculty members, science administrators, reviewers, journal editors, biomedical investors, patent officers, and consultants will reverse the “glycoscience desert” at many institutions and levels and begin to infuse knowledge about glycans into teaching, research, and the knowledge base of physicians and scientists. As demonstrated by the successes of the current NHLBI-sponsored Programs of Excellence in Glycoscience mechanism, a quick way to achieve this goal in the short term is to develop programs of supervised research training to bring more young investigators at the postdoctoral and starting faculty level into the field. This type of intensive immersion training of those late in their training careers has been shown to have a significant positive outcome in keeping trainees in the field when they embark on independent careers. 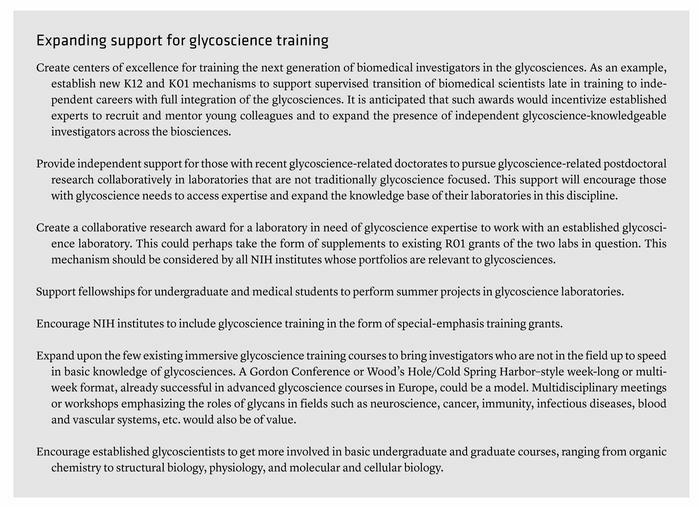 We propose that specific steps can be taken to address this gap for young investigators, as detailed in Expanding support for glycoscience training. Glycans are ubiquitous in all living cells and organisms, where they serve essential functions, ranging from acting as structural components to regulating physiological and pathological processes. Evidence clearly indicates that glycans represent a largely untapped resource for biological discovery as well as unanticipated therapeutic opportunities. However, among the major classes of biomolecules, glycans have generally received the least attention, in part due to a self-perpetuating underappreciation of their biologic impact, their inherent structural complexity, and the lack of tools to synthesize and analyze them. This is changing, with new capabilities and new resources focused on enhancing research tools in glycosciences. While such investments are very worthwhile, they will fall short of their promise unless the stark deficit in training and knowledge in the field is vigorously addressed. The committee feels that using a bottom-up approach of emphasizing training and incentivizing an increased number of young investigators will begin to reverse the self-perpetuating underutilization of glycosciences in biomedical sciences, resulting in outsized benefits towards enhancing knowledge and tools in the discipline and thus more effectively meeting the mandates of the NIH in particular and the biomedical research enterprise in general. Conflict of interest: J.B. Lowe is employed by and holds stock in Roche. T. Flotte has worked as a consultant at Dimension Therapeutics. D. Walt is a member of the Boards of Directors of Illumina, Cerulean, Quanterix, Exicure, and Ultivue Inc. J.L. Magnani is employed by and holds stock in GlycoMimetics. I. Weissman has worked as a consultant and holds stock in Stem Cells Inc. and Forty Seven Inc. J.I. Gordon is a cofounder of Matatu Inc., a company characterizing the role of diet-by-microbiota interactions in animal health. R.J. Roberts is employed by New England BioLabs Inc., which sells glycobiology reagents in its product catalog. Reference information: J Clin Invest. 2016;126(2):405–408. doi:10.1172/JCI85905. National Research Council. Transforming Glycoscience: A Roadmap for the Future. Washington, DC, USA: The National Academies Press; 2012.